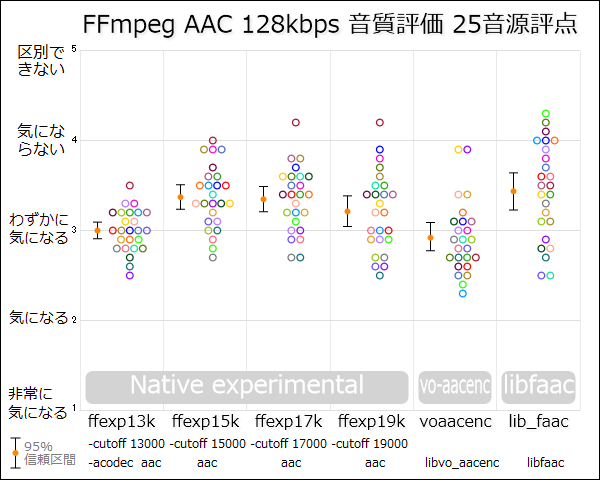 bin\ffmpeg42106 -y -i %InputWavFile% -aprofile aac_low -acodec aac -strict experimental -ab 128k -cutoff 13000 "%OutputFile%%Aac1Name%"
bin\ffmpeg42106 -y -i %InputWavFile% -aprofile aac_low -acodec aac -strict experimental -ab 128k -cutoff 15000 "%OutputFile%%Aac2Name%"
bin\ffmpeg42106 -y -i %InputWavFile% -aprofile aac_low -acodec aac -strict experimental -ab 128k -cutoff 17000 "%OutputFile%%Aac3Name%"
bin\ffmpeg42106 -y -i %InputWavFile% -aprofile aac_low -acodec aac -strict experimental -ab 128k -cutoff 19000 "%OutputFile%%Aac4Name%"
bin\faad -b 4 -o %Aac1Decode% "%OutputFile%%Aac1Name%"
bin\faad -b 4 -o %Aac2Decode% "%OutputFile%%Aac2Name%"
bin\faad -b 4 -o %Aac3Decode% "%OutputFile%%Aac3Name%"
bin\faad -b 4 -o %Aac4Decode% "%OutputFile%%Aac4Name%"
bin\ffmpeg42106 -y -i %InputWavFile% -acodec libvo_aacenc -ab 128k "%OutputFile%%Aac5Name%"
bin\faad -b 4 -o %Aac5Decode% "%OutputFile%%Aac5Name%"
bin\ffmpeg18607 -y -i %InputWavFile% -acodec libfaac -ab 128k "%OutputFile%%Aac6Name%"
bin\faad -b 4 -o %Aac6Decode% "%OutputFile%%Aac6Name%"
it under the terms of the GNU General Public License. Decoding sound_out\05ta_.ffmpeg42106.native-cut13kHz.mp4 took:  0.06 sec. 65.10x real-time. Decoding sound_out\05ta_.ffmpeg42106.native-cut15kHz.mp4 took:  0.05 sec. 85.88x real-time. Decoding sound_out\05ta_.ffmpeg42106.native-cut17kHz.mp4 took:  0.06 sec. 64.07x real-time. Decoding sound_out\05ta_.ffmpeg42106.native-cut19kHz.mp4 took:  0.05 sec. 85.88x real-time. Decoding sound_out\05ta_.ffmpeg42106.voaacenc.mp4 took:  0.05 sec. 85.88x real-time. FFmpeg version SVN-r18607, Copyright (c) 2000-2009 Fabrice Bellard, et al. Decoding sound_out\05ta_.ffmpeg18607.libfaac.mp4 took:  0.05 sec. 83.41x real-time.